We have decided to expand our existing Design Team, would you like to join? Each project made will need to be photographed ready to be promoted on both the blog and our social media pages. You will have to commit to our DT group for a minimum of 1 year. Don’t worry if you are a part of another DT group, pop an email over to us and talk to us, we are flexible! To be considered, we would like for you to upload 3 of your best projects to the Inspiration area with the title ‘DT Call 2017’ before 23rd October 2017. You can upload any type of craft whether it’s home décor, card making etc. The choice is in your crafty hands! We would like to get to know you so COMMENT below telling us a little bit about yourself, your craft style, any blogs or public social media pages you have and what other DT groups you are currently on. Once you’ve done that all you need to do is sit back and wait, we will let successful applicants know by early November. Hi, I'd love to apply, do the projects have to be done in Trimcraft products? Or can I use other items just to show you what I can do? This is me now logged in. As I said in the email below I have recently had my designs shown on TV on Hochanda for Katy Sue Designs as a spot as a guest design team member so I fully understand what is required of a design team member. I have a blog at http://towneleycrafts.blogspot.co.uk/, a facebook page - Towneley Crafts and am active on Twitter, Instagram and Pinterest. I am an avid card maker and would love the opportunity to be able to show off my craft with top quality products. I'd really love to apply, I have a blog http://towneleycrafts.blogspot.co.uk/ I am also active on facebook and have recently been a Guest Design Team member for Katy Sue Designs on Hochanda. How do I submit photographs? Does it have to be done with Trimcraft products? I don't have many but can show you what I can do with dies and papers. I really enjoy papercrafts in particular making cards but have started doing vinyl projects too. I use my cricut explore and my sissix big shot for a lot of my projects. My instagram is jennysteeps and I also have an album on my Facebook page Jenny Hine. I'm not currently on any other DT groups but would love the opportunity! Hello! My name is Elle and I am the face behind Jisea Designs, you can find me on Instagram, Facebook & Twitter using the username @jisea.designs I love paper! I love making cards, I do own a Big Shot and a large stash of dies but I also enjoy making things by hand such as kids characters like Woody from Toy Story or Superheroes. I have a list of different crafts I want to try and learn and I'm hoping being a part of the Trimcraft DT can help me learn new some crafty skills and techniques I can use in my projects. I'd love the opportunity to be considered for the Design Team. I've had a few of my cards featured in craft magazines , I'm active on Pinterest & Facebook. My style is Clesn & Simple and my main love is Diecutting but I love to try different techniques + styles. . Not sure where I upload my 3 photos to for this application. Hi, My name is Dawn and I am a Design Team member for Daring Cardmakers. I am also a Spellblogger for Spellbinders. I love sharing ideas with others and love an excuse for coffee, cake and a bit of crafting with my friends. Here is my blog: http://allthingsprettycraftee.blogspot.fr/ Thank you for this great opportunity and good luck everyone. Hi, I've been crafting for about 15 years and my craft of choice is papercraft. I enjoy making cards but have moved into home decor more recently. I am active on instagram account: @craftybugcards and a facebook account http://facebook.com/craftybugcards I am not a member of any design team at the moment and would love the opportunity to do so. I am a scrapbooking and cardmaking gal. I make 12x12 layouts and Project Life. My scrapbooking style is clean, bright and bold but I'm not adverse to layering and lots of texture. I enjoying crafting to a theme. I'm a stamping gal at heart and love embellishments especially if they are wood or metal. You can find me on IG as helenrockabillygirl and on Blogger as Crafty Island Gal. Hello. Im gemma louise moulds. Im a papercrafter I have been for around 5 years and love it. I find it so relaxing and each creation of mine is unique. I use various social media. Mainly facebook but I also have a twitter and instagram account too. I am not currently on any design teams but would love to be part of one. Hi! I'm Heather, I'm 23 and I make up one half of the Taylor Made Card Co, I absolutely love all things papercraft and will try my hand at most things, but card making is my favourite! I'm on Facebook - taylor made card co and Instagram @taylormadecard, I have also just started up a blog - taylormadecardco.wixsite.com/website I'm not currently part of any other DTs but I would absolutely love the opportunity to try out some new techniques and styles with some of your amazing products! Hello my name is Tracy Watkiss and I used to demonstrate for Trimcraft a few years ago, only left as my husband took poorly, thankfully he is well now and I would love the chance to work with your products again. My user name back then was craftytracy, and I posted several tutorials on the old forum. I am active on Facebook, Instagram, Twitter and am getting back into blogging as well as podcasting on you tube. Hi, my name is Sabera and I am passionate about card making and all crafty things. 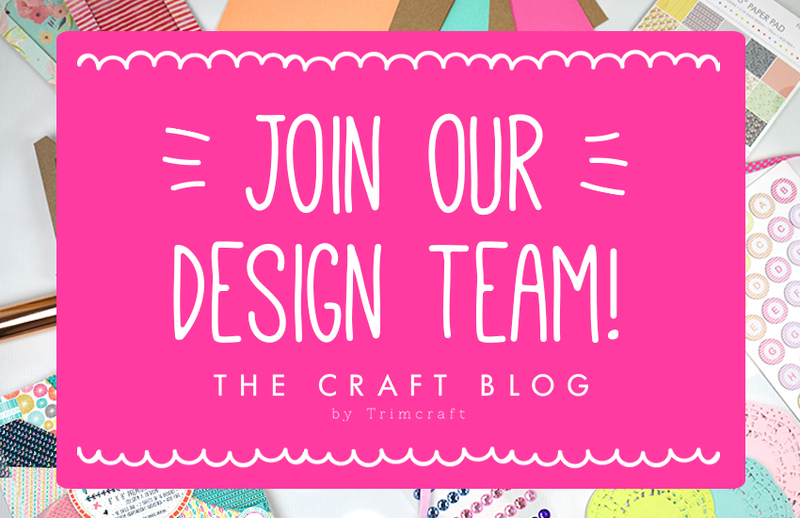 I would love the opportunity to join the Trimcraft Design Team and feel that my creativity, inspiration and designs would compliment the faboulous Trimcraft range which I am a huge fan of. I am not with any DT, this is the first time I am applying. I have had my cards featured in card magazines, made cards for the Readers Design Team, chosen to be designer for the day for a magazine. I have also had cards featured on social Media, Trimcraft included 😊 and won online card making competitions. I am active on Instagram and have an instagram account. Sabzcards_handmade. I am always up for a challenge and always trying out new techniques and crafts. Thank you for the opportunity to apply and I do hope that my enthusiasm, creativity and commitment will persuade you to consider me. Wishing everyone the best of luck. Hi I've been crafting for around 9 years now and love card making! I currently design for Hunkydory, Bee Crafty and Imagine Design Create and have just finished my second term with For The Love Of Stamps. My blog is https://handmadebylorre-anne.blogspot.com , Instagram ( www.instagram.com/lorreannearchibald , Pinterest ( https://uk.Pinterest.com/lorreanne0565 and Twitter @LorreAnne78. I'd love the chance to be part of your design team and understand the need to create samples of a high quality and to work to deadlines.